March Madness at Islands Burgers - San Diego Dining Dish! Now through the championship game on April 2, basketball fans can take advantage of primo happy hour specials at Islands Burgers. Included in the specials are a $8.95 hot dog and 16 oz. Coors Light pairing. Regular happy hour specials are still in effect in the bar area Monday-Friday, which include $4.75 sliders, $4.95 Cheddar Fries, and tropical drinks like the Mai Tai or Mojito for under $5. I'm always happy to indulge in Islands tremendous burgers and drinks, so we checked out their happy hour on Monday! We started with a signature drink from Islands, the Big Island Iced Tea. It's a twist on a Long Island Iced Tea, trading the sour mix and cola for pineapple juice and strawberries. The result is quite sweet, and refreshing! We also shared a Longboard beer, because what goes better with a burger than a cold beer? It was so perfect and frosty. For dinner, we chose the Malibu burger, a classic bacon cheeseburger, and substituted regular fries for cheddar and bacon fries! Because life is better with more bacon and cheese. The burger, like all their burgers, was juicy, delicious, and huge! It's not diet food for sure, but life is meant to have some indulgences. The second sandwich we chose was the Sandpiper chicken sandwich. Islands is known for their burgers, but the chicken sandwiches should not be overlooked! The chicken was grilled and very moist, with a buttery flavor accented by sauteed mushrooms and Swiss cheese. 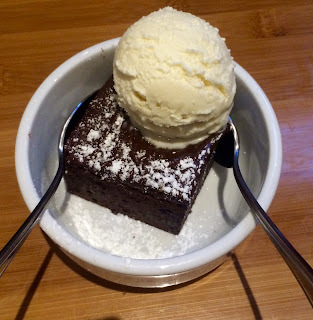 Islands has full-sized, indulgent desserts, but after the big burgers and beers, we had room only for a personal-sized brownie with a scoop of ice cream. Just a couple of delightful, chocolate bites. The championship game is this weekend, so hit up Islands for some great specials!